This somewhat unique photograph shows a Spitfire Mk. V of No. 416 Squadron RCAF, DN-T, serial no. 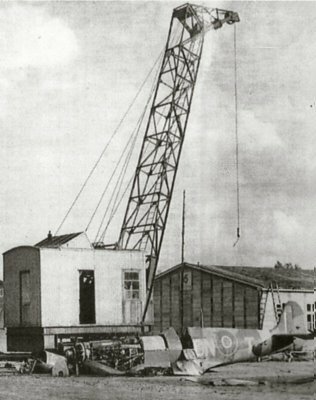 AB284, in captivity at the concentration camp in Vught, the Netherlands. The aircraft was shot down by ground fire during a Rhubarb mission between Goes and Tholen crashing by Bath (8 km south-west of Woensdrecht airfield) in the South of Holland on Nov. 25th, 1943, 14.35 hours Dutch time. The pilot, F/Sgt. P.R. Carpenter, was reportedly taken prisoner. The aircraft was taken by the Germans to Vught to be dismantled by the Dutch political prisoners in the camp. Concentration camp Vught was officially referred to as Konzentrationslager-KL Herzogenbosch and was an establishment to imprison and torture prominent Dutch and Belgian citizens, also acting as a transit camp for Jews being deported to Germany. The photo was most probably taken by a British soldier (?) after the liberation of Camp Vught in October 1944. Peter, sorry, must have missed this – contact me via the website ref this photo. Yes, I have it at high resolution. I have checked the high resolution photo again and the serial number is for sure DN-T IJ832?